Summer is a great time to research schools. So today I want to share a great online resource to help you evaluate colleges. It’s called COLLEGEdata. COLLEGEdata can provide a ton of information on any college. I think it’s more indepth than what you can find by heading to the College Board and accessing a college’s profile through its College Search function. I was demonstrating what you can discover on COLLEGEdata today with a high school student. 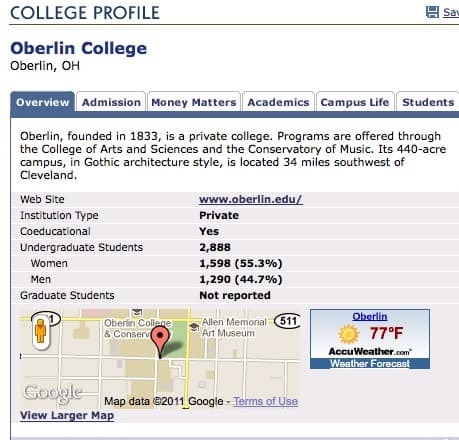 To see how the site works, she asked me to check out Oberlin College, a school that’s on her list..
From this page I clicked on the categories at the top that includes Admission, Money Matters and Academics to delve into each area. 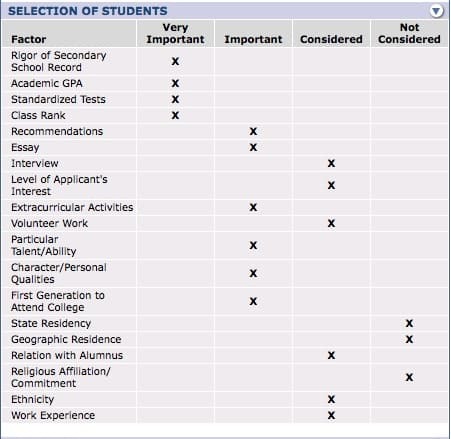 When clicking on the Admission category, I found Oberlin’s rankings of 19 admission factors and which the admission staff considers a big deal and those they don’t. You will also find a breakdown on Oberlin freshmen’s grade point averages and test scores and other info. Since paying for college is daunting for most parents, I always head to a school’s Money Matters section. Oberlin College is especially generous. 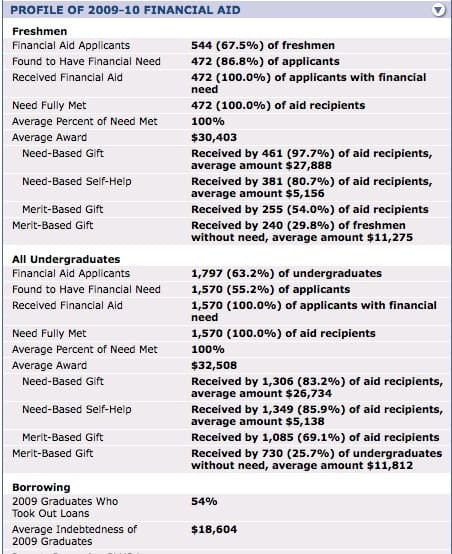 As you can see, the 472 freshmen who required financial aid had their full need met. Only a few dozen schools in the country can match that. What’s more, most of the need-based aid came in the form of a need-based gift or grant that is free money. The average need-based grant is $26,734. The school also awards merit aid to some wealthy students, who don’t qualify for need-based aid. The average award is $11,812. Now is a good time to start researching schools. It’s better to do the research well before you ever finalize your college list. Lynn O’Shaughnessy is the author of The College Solution and she also writes a college blog for CBSMoneyWatch and another for US News & World Report. Follow her on Twitter. Should Professors Work As Hard As We Do?